It is important to check your car battery regularly especially as it starts to age as it is one of the most common causes of vehicle breakdowns. It will only take 5 minutes to check and is a simple test which checks the voltage output, charging rate and charging system, this will determine whether a battery failure is likely or not by comparing the result against the manufacturer’s specification. 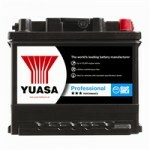 If your battery does require replacing TyreFinders can supply and fit batteries to all makes and models of vehicles. If you would like a quote on a new battery please complete the ‘Get a Quote’ tab at the top of the page.